Soros spent $958,000 supporting Gonzales’s cause through a super PAC, Texas Justice & Public Safety, according to campaign finance records reviewed by TheDCNF. The super PAC churned out attack ads against LaHood, accusing him of being racist. 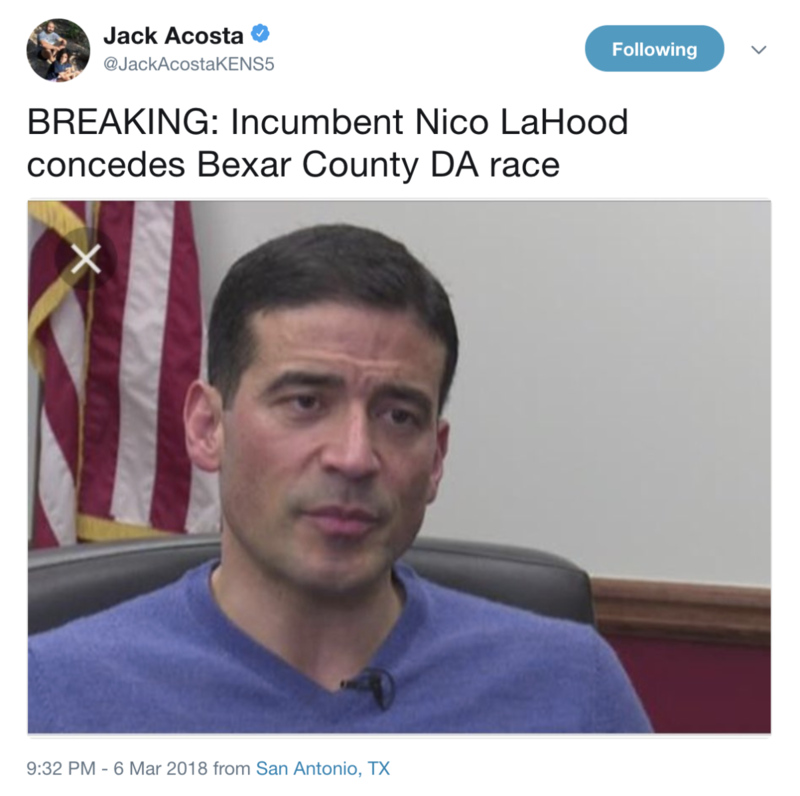 LaHood accused Soros of trying to buy the election for Gonzales. Soros’s super PAC spent $897,000 of his money in the final 30 days before the election, campaign finance documents show. Gonzales is now considered the favorite to win the DA election for Bexar County, which includes the city of San Antonio and is one of Texas’s largest counties. If he wins, Gonzales will join at least 11 progressive lawyers since 2015 who have won district attorney’s seats thanks to massive financial donations from Soros. Soros has the routine down. He uses powerhouse Democratic law firm Perkins Coie to set up a super PAC named some variant of “Justice & Public Safety.” The super PAC will surface late in a DA race, using the kind of capital typically reserved for a national political race to fund a series of attack ads benefitting Soros’s preferred candidate, who wins almost every time. The goal is to influence the nation’s criminal justice policies from the ground up by boosting progressive lawyers to victory in DA races around the country. It’s legal and appears to be working. Soros poured $7 million into 11 district attorneys’ races across the country between 2015 and 2016, the Washington Times found. Soros’s preferred candidate won in nine of the 11 races. Soros repeated the move in two more races in 2017 tracked by The Daily Caller. Soros spent almost $2 million on the two races. His preferred candidate won both times. Soros spent just under $1.7 million to help Philadelphia attorney Larry Krasner win his city’s DA seat in November. Soros pushed the money through his Philadelphia Justice & Public Safety super PAC. Soros gave the bulk of the donations, $1.45 million, during the primary, boosting Krasner to victory over a crowded Democratic field. Krasner coasted to victory in the general election. He purged 31 prosecutors in his first few days on the job. The Democratic billionaire poured another $100,000 into a race for Portsmouth, Virginia’s DA race last November. Soros gave the money through a national super PAC called Justice & Public Safety. His preferred candidate, Democratic incumbent Stephanie Morales, coasted to victory. Remarkably, Soros’s investment in the race received no media coverage until after the voters had cast their ballots. Soros is also funding third-party organizations which are, in turn, targeting DA races in the 2018 elections. Soros-funded groups including the ACLU are making local DA races a national cause for progressives, which has tilted the playing field in favor of progressive lawyers. Soros’s Open Society Foundations gave the ACLU a $50 million grant in 2014 to fight mass incarceration. In 2018, the ACLU is “planning voter education and outreach campaigns in district attorney races in California, Florida, Maine, Massachusetts, Minnesota, Oklahoma, Oregon, Vermont and possibly North Carolina and Missouri,” McClatchy reports. The Soros-funded Color of Change PAC is also targeting DA races and seeks to mobilize black voters in favor of progressive candidates. Contributed by Peter Hasson of The Daily Caller News Foundation.